Grand Opening of BHOwigs.com offers discount wigs and hair pieces for those who suffer from damaged hair or are just looking for a new look. affordable wigs that are in style and of the best quality. A study by Proctor & Gamble reveals that a reported 73% of women say they suffer from damaged hair. 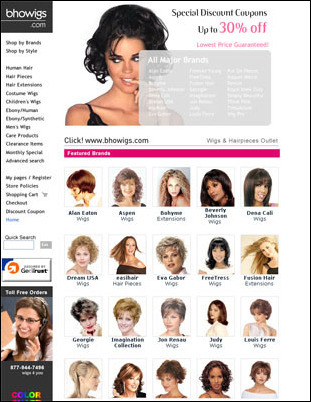 The Grand Opening of BHOwigs.com offers an affordable solution for those with distressed tresses. Instead of increasing wear on their hair with dye jobs and processing, women can now give their locks a break with Best Hair Outlet’s discount wigs and hair pieces. They carry a variety of looks including celebrity wigs, ebony wigs, clip in hair extensions, high fashion wigs, ponytail hair extensions, cheap Indian remi hair, synthetic hair pieces and natural hair pieces. The convenient navigation panel allows visitors to browse by brand or style to find the wigs that best suit them. BHOwigs.com offers enough styles of discount wigs that women will be able to find their style, whether it be short and modest or long and sultry. The low prices available at Best Hair Outlet make the option of having multiple styles alluring. Women can choose a few wigs and hair pieces to make their collection satisfy their daily whims. This variety is one of the factors that made the TV show “Alias” so popular. Thousands of women would tune in just to see what character Jennifer Garner would become that week and which wig she would don to express her new persona. BHOwigs.com is a way for women of non-celebrity status to achieve their own variety and create their own “Alias”. The discount wigs at Best Hair Outlet make seeing what it would be like to be a redhead or a blonde or whatever color you can dream of an affordable reality with the dyeing and damaging commitment. Sam Chang is the owner of Best Hair Outlet, Inc. He began his career in Korea manufacturing make-up brushes in the mid 1980s. He has since expanded his extensive background in beauty supply to retail, where he owns one of the top beauty supplies in Southern California. Beguile by Raquel WelchA combination of a straight and curly mid-length silhouette. Fun for any occasion. 18" Set (8 pc) by Put on Pieces The PutOnPiecesTM 100% human hair clip-in extension is made from the "temple Remy" human hair which is one of the finest human hair. This set available in nine different colors.